Nigel Whorton (422) on his side. Photo courtesy of Paul Tully. 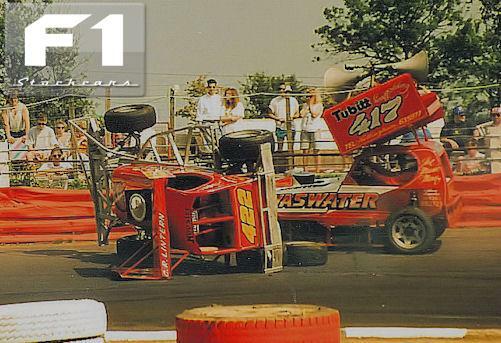 An unassuming racer from the west midlands, the driver of the 422 car is remembered as being an unwarranted target of the terrace boo-boys. Not because of an over-aggressive driving style, but because he appeared to arrive in the sport with something of a silver spoon in his mouth. Fresh out of ministox at the end of the 1979 season, Nigel had a blistering start to the 1980 season in a purpose-built Clive Lintern car. Not that Clive Lintern was a renowned car builder at the time, but nevertheless, the 16-year old Nigel went from white to red in one month, on the back of a brace of finals. He spent most of the decade entrenched in the star or superstar grade, tallying almost sixty finals. Equally impressive, however, was the continued improvement of successive Lintern cars, which rapidly became the benchmark of small oval quality; always beautifully presented and race prepared. 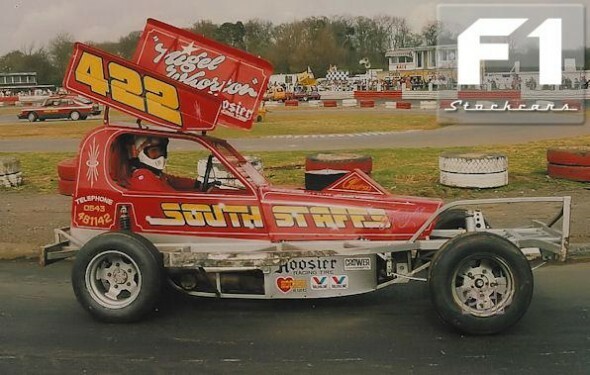 Nigel seemed poised to become the sport’s premier driver as the 1990s unfolded, but it never quite happened, and after a career spanning a decade and a half, with a solitary title – British Champion in 1986 – the Whorton name disappeared from the sport. Further Photographs of Nigel Whorton can be found on Brian Watson’s excellent website Ovalaction.com – Click HERE to be taken direct to Nigel Whorton’s page.